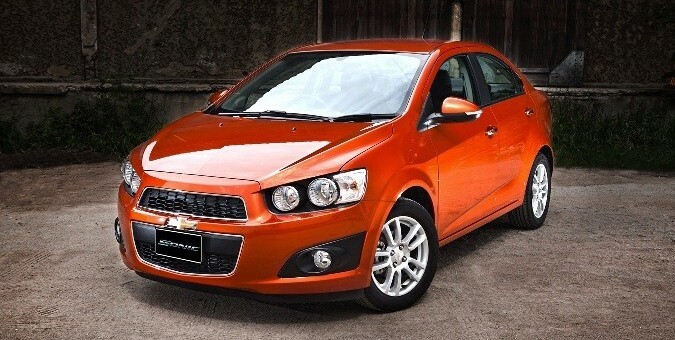 General Motors anticipates that an updated Sonic subcompact will allow it to sell over 100,000 Chevrolet vehicles in Thailand in 2013. The automaker initially launched the Gamma-based sedan and five-door hatchback in late 2012 with the 1.4 liter Ecotec four-cylinder engine (LDD), but will replace the powerplant with a slightly larger 1.6 liter E85-capable Ecotec (LDE) engine by the end of July. Initially, The General launched the Sonic with the 1.4 LDD first to allow the vehicle to qualify for a government-supported first-time car buying program, which required eligible vehicles be made in Thailand, be powered by engines displacing 1.5 liters or less, and cost less than 1 million baht ($32,200 USD at current exchange rates). The newly-available 1.6 liter engine makes 115 hp at 6,000 rpm and 155 Nm (114 lb-ft) at 4,000 rpm, a 15 horsepower and 19 lb-ft increase over the 1.4 liter LDD motor that makes 100 hp and 95 lb-ft of torque. The Sonic line is expected to make up at least 30 percent of total Chevrolet sales in Thailand — the only brand GM currently offers in the Asian country. The automaker sold 75,461 vehicles in Thailand in 2012, and expects that number to grow to 100,000 in 2013. It sold 26,823 Chevrolets locally during the first five months of the year (up 0.53 percent year-over-year); of these, 6,602 were of the Sonic, which is pretty much the same vehicle sold elsewhere in the world except for a few minor trim level and powertrain differences. The car made at GM’s manufacturing plant in the Rayong province for the Thai market for the local and nearby markets (for export). The facility has a maximum annual production capacity of 180,000 vehicles. The Sonic nameplate has become very successful in the Thai market, making it the fifth-largest for Sonic consumption worldwide in the first quarter of 2013, behind the United States, Russia, China, and Mexico, in descending order. The addition of the E85-capable 1.6 liter engine, the MyLink infotainment system with a seven-inch color touchscreen (a segment first), and two new colors (Orange Rock and White Metallic) are all part of the update to the car, building on the 14,858 Sonic units sold in Thailand during the first five months of the year; 9,732 of these were sedans. By contrast, GM sold 8,256 Sonics in Thailand in all of 2012. GM’s (get ready for this title!) Vice-President of Sales, Marketing and Aftersales, Chevrolet Sales Thailand and GM Southeast Asia Operations, Mr. Gustavo Colossi, said that he has “no doubt the Sonic 1.6 will be equally successful.” Neither do we. Alex, love that title they gave him. “Aftersales” does that mean used cars or P. R. customer service after the sale? At GM, Aftersales means Service and Accessory Parts. Paul — yupp, what @T. Bejma said.